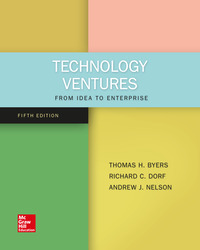 Drawing on the latest academic research and practitioner insights, Technology Ventures integrates clear theoretical frameworks with action-oriented examples and exercises. Its broad perspective on technology ensures wide-ranging appeal to anyone with an interest in high-potential ventures. Special attention has been paid to university technology commercialization, open source innovation, and opportunities in mobile, digital health, 3D printing, and energy tech.